During the last week of April, 2005, history was made at Antigua Sailing Week, one of the top five yacht racing venues in the world. 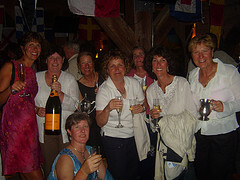 For the first time an all female team won their division and won the prestigious overall fleet prize. A team of nine women (whose ages average 50 years!) sailing 'Seabiscuit', a ten-year-old Beneteau 445, had the fastest racing times in a fleet of 73 boats. No luck involved here - this was a group of very talented, very fit women who were sailing a fast, well prepared boat. Not to be left behind in cyberspace, sailing student Jennifer Hagan has created a blog for Sistership; a place for 'EX PAT's' (i.e. any former 'Sistershippers') to post sailing experiences, sea adventures, stories, photos, insights, tall tales, outlandish fabrications, the best spots to sail, drink and anchor in all seven seas.